Shangri-La Toronto is a luxury hotel and condominium tower under construction in downtown Toronto, Canada. It was designed by Vancouver based architect James Cheng is being built by Westbank Projects Corp and Peterson Group. This is the same team that was responsible for building the 201m Living Shangri-La, the tallest building in Vancouver as well as a number of other iconic structures in that city. 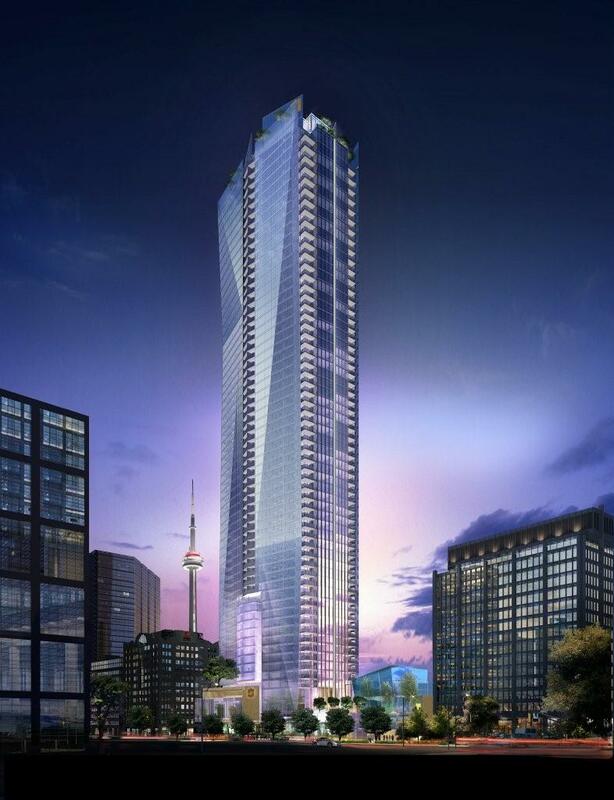 Shangri-La Toronto will be 214 meters tall, and will be one of the ten tallest buildings in Toronto upon completion. The hotel component will be run by Shangri-La Hotels and Resorts and is planned to have 200 exquisite guest rooms. The condominium portion will occupy the upper floors of the building and consist of 353 units. Excavation of the site started in 2008, and work on the parking garage began in early 2009. The Toronto Shangri-La is located on University Avenue and Adelaide Street, in an area just west of the Financial District that has seen rapid growth in recent years. The site was previously home to a number of smaller structures, most notable the historic Bishop's Block. The Bishop's Block was built in the 1830s by John Bishop who built a series of Georgian row houses on the site and developed it as a high end residential district. One of the first residents was author Anna Brownell Jameson. Most of the buildings were eventually torn down and replaced with a large parking lot. The one exception a structure that served as one of the city's first hotels and then as a pub for many decades. It too was abandoned for several decades, but as a heritage structure was not torn down. This building was disassembled for the construction of Shangri-La, but the developers have pledged to rebuild and restore the Bishop's Block as part of the project. Prior to excavation the site was the subject to several months of archeological exploration, and many artifacts from the city's early history were found. Because the way we define our environments because who we are. Design matters - for individuals, for cities, for the future. Do not take design for granted, it will outlast us. So scrutinize it. Celebrate it. Relish it. The Design of your home, from the entranceway to the organization of your closet space, must provide a worthy frame for a passionate life. The living Shangri-La Toronto design team has decades of architectural prowess and expertise and has considered every detail from concept drawing and five-star amenities, to detailed specifications and appliance selection, optimizing every facet of your day-to-day satisfaction and pleasure. Because it matters. The 200-room luxury hotel will be built in a new 66-storey tower on University Avenue at Adelaide Street, due to open second quarter 2012. The Shangri-La Hotel, Toronto, will occupy the first 17 floors of this development, which incorporates the historic "Bishops Block"- one of the oldest remaining buildings in Toronto. Located on the west side of University Avenue at Adelaide Street, this Toronto hotel is ideally sited in the center of the financial and entertainment districts and is an easy walk to major downtown office buildings. Bloor & Yorkville shopping and dining areas, theatres and performance venues are also easily accessible. The Shangri-La Hotel, Toronto will be Shangri-La's second property in Canada following the debut of the Shangri-La Hotel, Vancouver in January, 2009 by the same development team. Contact me today to receive further updates on Shangri-La Toronto and be placed on an exclusive list to preview.